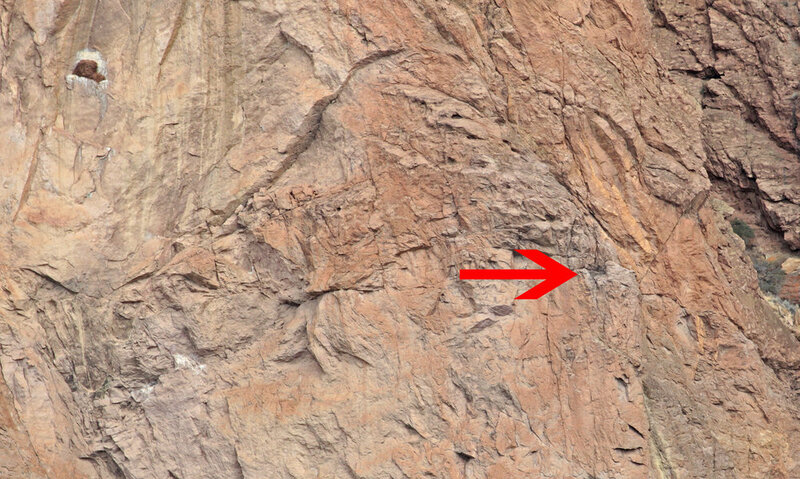 The golden eagles' nest is a bit of a challenge to spot. While golden eagle activity has been going on since January, watchers Interpretative Ranger David Vick and Park Volunteer Naturalist Steve Lay could not find the nest they were using. Perched high on the walls of the Monument Area, they finally spotted it this week on the formation called “Little Three Fingered Jack”. Ranger David has not seen it used in the 30 years he has been observing. They suspect that there was a nest there previously and they never noticed it, as It is pretty inconspicuous. And since they don’t know when she laid eggs, they have no clue about a hatching date. 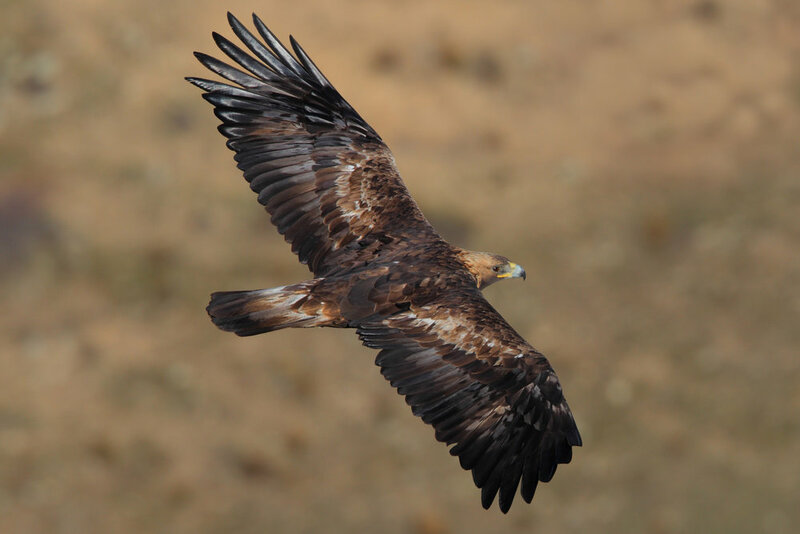 Typically golden eagles in the park hatch in early April. Closer view of the golden eagle nest on Little Three Fingered Jack. Photo courtesy of Steve Lay. Golden eagle nest location overview on Little Three Fingered Jack. Photo courtesy of Steve Lay. Proud mama golden eagle hanging out on the nest on Little Three Fingered Jack. Photo courtesy of Steve Lay. 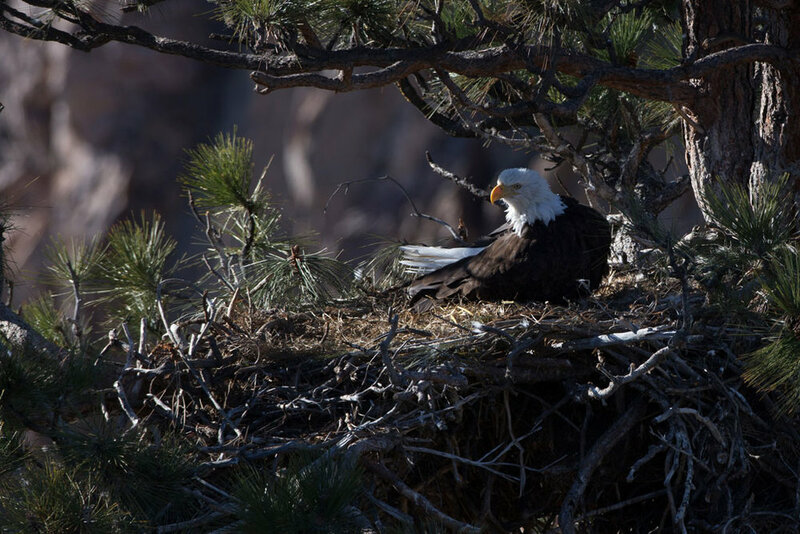 The bald eagles return each year to the nest in a giant ponderosa off of the Canyon Trail in the river canyon below. Bivy Campground Canyon Rim tent sites are now closed as of February 6, 2018. Look for the posted signs in the affected areas. The rest of the campground is open, with only a few tent sites closed along the rim. If you'd like to photograph these magnificent creatures, please contact the Park Manager at 541-548-7501. Both amateurs, as well as world-famous wildlife photographers, have come to Smith Rock on a yearly basis to get amazing shots. Again, please help keep this wonderful event happening each year by contacting the Park Manager at 541-548-7501 if you'd like to set up on the rim to photograph them. Ranger David looked at the nest on March 24 and saw the adults switch places, although he did not see the eggs or any juveniles. In the past the bald eagles in the park have hatched around the last week of March. Proud parents and their 11 day old eaglet in 2017. Photo courtesy of George Lepp. Baby grows up but still needs help in 2017. Photo courtesy of Rick O'Shea. Getting some food for junior in 2017. Photo courtesy of Rick O'Shea. While you might not have all the gear this guy has, you can still snag a decent picture with a zoom setting on your camera or a setup like the one to the right. Photo courtesy of George Lepp. This was shot in 2017 holding an iPhone up to a spotting scope on a tripod. Haven't spent the time in the Welcome Center yurt to see this incredible footage from George Lepp? Spend 11 minutes now and watch last year's eaglet from birth to fledge in amazing 4K detail. This video is about the bald eagle nest project in 2017 taken in Smith Rock Stae park, Oregon. Mr. Lepp spent over 120 hours at the nest site, traveled 1860 miles back and forth, and spent many hours editing the weekly video clips to send out the 4K video frame grabs on social media. These eagles have nested at this site for the last six years and similar video is posted on mr. Lepp's website from 4 years ago (www.GeorgeLepp.com).